MBT-80 was Britain's unilateral programme to produce a Chieftain replacement following the termination of the Anglo-German FMBT project. 99SP27 is currently at Bovington. The hull, identified as ATR 2, was an automotive test rig of which it has been said "could only have come out of Chertsey" (FVRDE/MVEE). It is constructed of steel and aluminium in an effort to save weight: steel at the front, aluminium at the rear with a sandwich layer of stainless steel between the two to overcome the impossibility of welding steel and aluminium together. Cracks are apparent at the rear of the vehicle where side and rear plates meet. Unfortunately the turret and hull of 99SP27 do not belong together. The turret was part of a research programme to study offset mounts. If successful it may have found its way into MBT-80. The turret that is closely related to what would have been inside MBT-80 is the Weapon System Demonstrator (WSD), formerly the Fire Control Rig (FCR),which is also at the Tank Museum. This is mounted on a FV4030 hull. When MBT-80 was cancelled the FCR turret continued on as a Research Programme at MVEE Chertsey (1984-RARDE Chertsey) where, amongst other things, various gunner's two axis stabilised sights from UK manufacturers were trialled. These sights were with the rig when the MBT-80 project stopped, so in all probability the winning design would have found its way onto MBT-80. The commander's cupola was stabilised in traverse and the sight mirror stabilised in elevation. As part of the programme the commander also received a Panoramic, Thermal Imager, Laser Integrated (PANTILI) Sight. As the title suggests this was a 360 degree rotating thermal imager fitted with a CO2 (Carbon Dioxide) laser. This was fitted on the loaders side of the roof, but the images were available to both the commander and gunner in much the same way as M1A2 now has CITV. Pantili now resides at the Aldershot Military Museum and WSD has a wooden mockup fitted. Internally the FCR had a digital databus linking the main sub systems. The Fire Control Computer processing was fully digital and by the mid-80's the Gun Control Equipment processing was all digital too. For field trials the turret was originally fitted to a Chieftain hull, but as the programme progressed it later transferred to the hull it is now on at Bovington. The turret is actually a FV4211 turret, presumably because the interior would have been similar to MBT-80 (if one was ever to be built). Should you see the WSD at Bovington you will notice thick vertical plates mounted on the turret front either side of the gun, these are simply ballast weights to raise the inertia of the turret to represent that of an armoured turret. MBT-80 is an excellent example of how politics and the international situation can affect the development of a tank. To begin with the collapse of the original Anglo-German programme that resulted in the JagdChieftain convinced both sides that a conventional turreted tank was the best answer but since each country had its own ideas on future tank design there is very little evidence of further collaboration. 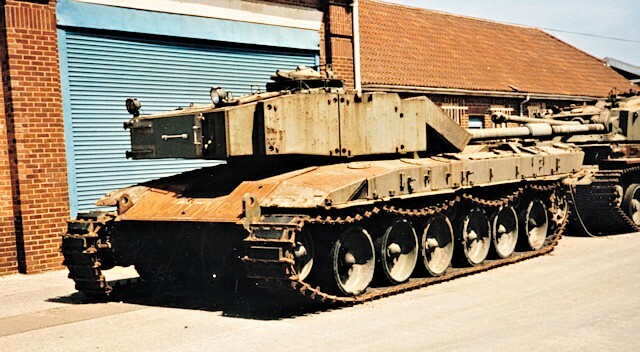 Work on a British design began around 1973 so the chosen title Main Battle Tank 80 was something of an aspiration, which would never be fulfilled. The plan was to have the new tank ready to replace Chieftain in the early eighties although even this proved to be ambitious. The hull was assembled by Government engineers at Chertsey. MBT-80 would have been a relatively conventional turreted tank with a four-man crew, a 120mm rifled gun and a version of the Condor CV-12 engine that developed 1500hp. The basic hull is a composite of steel and aluminium which would have been clad in Chobham armour and outwardly would have resembled FV4030, which ultimately became Challenger. What you see here is in effect the skeleton of the hull before the Chobham armour was fitted and it is identified as ATR-2, ATR being Automotive Test Rig suggesting that this was intended to be a running chassis. In the event the fall of the Shah of lran resulted in cancellation of the Shir 2 contract which ultimately became the British Challenger 1. 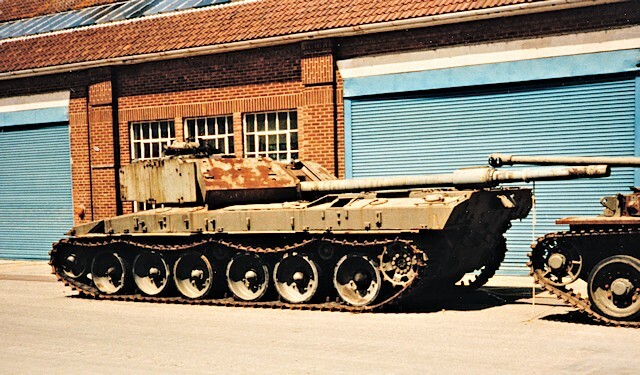 That, coupled with the escalating costs of MBT-80 and the fact that the programme looked like running on for years meant that it was cancelled and the hull came to the Tank Museum in 1991. The degree of secrecy surrounding MBT-80 has made it difficult to research its story with any precision and in particular in respect of the turret. One source claims that the turret displayed here was intended as a replacement for FV4211, the so-called Aluminium Chieftain which is on display in the Tamiya Hall although it suggests that it may ultimately have been intended for MBT-80. However there is also evidence that another turret, presently fitted to another exhibit, an early Challenger, was the proposed turret for MBT-80. 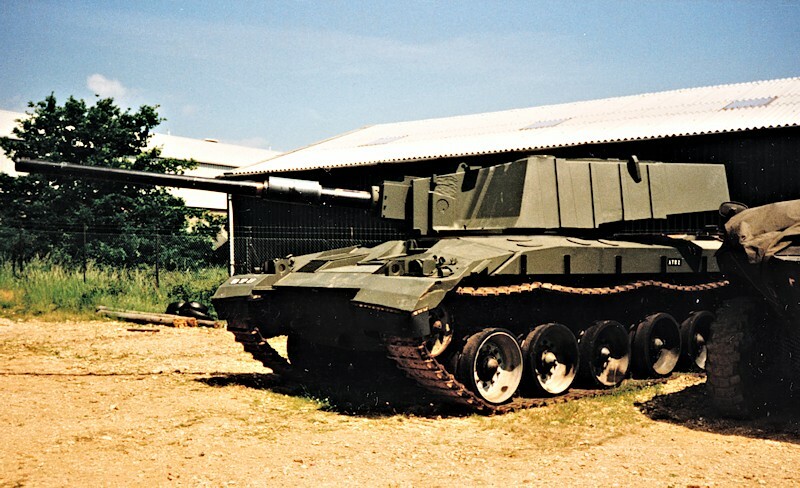 The turret present fitted to MBT-80 was delivered to the Tank Museum some two years after the hull so the evidence that they are connected at all may well be no more than circumstantial.